LEADER is a European programme, with the aim to involve local actors in rural areas in the development of their own regions by forming Local Actions Groups (LAGs) and designing and implementing strategies. The LEADER programme already exists for almost 30 years. Until now more than 2500 LAGs were established, covering over 50% of the rural population in the EU. 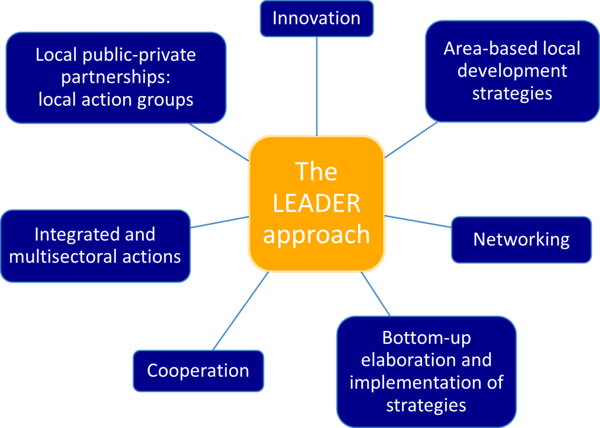 Besides cooperation LEADER is characterized by 6 other key features, shown on the chart. Following this link you'll find a speech of Robert Lukesch, local Development Expert and European Evaluator, held on the ELARD's LEADER RELOADED Conference in 2018 describing the evolution of LEADER and its current situation. What is Community-Led Local Development (CLLD)? While the LEADER programme gets financed by the European Agricultural Fund, the 7 key features of LEADER have been extended in this programming period (2014-2020) under the broader term “Community-Led Local Development” (CLLD) to other EU Funds. What is the difference between CLLD and the LEADER Approach? The main difference concerns the more tightly integrated approach and the diversified financing model. Until recently, allocation of LEADER programme resources for project support in rural areas only functioned with the support of European Agricultural Fund resources. Now, however, Local Action Groups in rural areas also have access to funds from the European Regional Development, Social and Fisheries Funds. The European Commission decribes CLLD as follows. What are the aims of CLLD? As a result, the deployment of a number of funds in rural areas will create better opportunities to ensure coherence in development activities and help avoid the hurdles that resulted from the earlier limitations, which saw some areas and needs failing to get attention or funds. Thanks to the more diverse funding mechanism, the LEADER Local Action Groups can now deal with more complex rural development challenges than before – such as cooperation between the rural, fisheries and urban areas, social cohesion and essential services for rural residents, services for the disabled and ICT. Starting with the present programming period (2014-2020), the use of CLLD multi-funds has been extended to the urban dimension. All three are subject to specific requirements laid out in the CPR. E.g. the targeted territory shall have a population of 10 000 to 150 000 inhabitants and the strategies shall include, inter alia, the objectives pursued, an analysis of the needs and potential of the area, and action and financial plans. The CPR also provides that CLLD shall be innovative in the local context and involve networking and cooperation. The European Commission has published guidelines for local actors to give them practical tools and suggestions for implementing CLLD in a range of context.